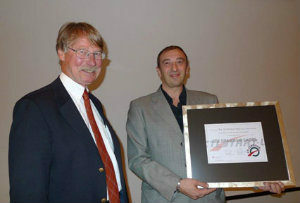 Bry -Air Prokon, was awarded the prestigious CTI “START – UP LABEL for – Ready for Sustainable Business Development” on Sept 14, 2010 by the Swiss Confederation’s Innovation Promotion Agency CTI. Till date only 200 out of the 1800 innovation projects reviewed by CTI; since its inception in 1996 , have been granted this prestigious label . In 2009, 143 start ups applied to CTI and only 70 was accepted for coaching . In 2010, only 11 companies were awarded the CTI start up label.The criteria for applying for the CTI label is stringent. This is Bry-Air’s second acquisition in Europe. CTI ..The Innovation Promotion Agency is the Swiss Government’s premier tool to support knowledge and technology transfer between businesses and universities. Compared to other countries, Switzerland has one of the highest levels of innovation. CTI Start-up was initiated by the Swiss Confederation’s Innovation Promotion Agency CTI in 1996. CTI contributes to strengthen the innovation performance of Switzerland’s business sector through accelerating the process of turning new scientific knowledge into innovative products, processes and services. Market-oriented R&D projects, which companies and universities work together on to develop products and services. Support is given to knowledge-intensive and technology-based companies with great market potential. Bry-Air is one of the largest privately held HVAC company from India with a global manpower strength of 1000+. Bry-Air has more than three decades of experience in the field of dehumidification & environment control solutions. It specializes in designing and manufacturing the desiccant based engineered dehumidification systems capable of handling applications such as Pharmaceutical, Food Processing, Electronics Industry, Cold Stores etc. Bry-Air (Asia) has been at the forefront of dehumidification and industrial air treatment technology with product range that also includes Gas Phase Filtration system, Resin Drying equipments, Product Dryers and complete environmental control systems. Bry-Air (Asia) has production Plants in Malaysia, China and Germany and representative offices in Middle East, South Africa, Philippines, Thailand, Italy, Korea, Japan and Australia. The company’s range of products find application globally across 40 countries including South East-Asia, China, CIS countries, Indian subcontinent, West Asia, Middle East and Africa including South Africa & Australia as well as USA and Japan.